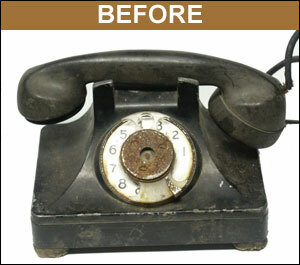 We will repair and make your phone functional. We will give you a quote on all parts, repair and labor beforehand. Customers are encouraged to include a detailed description of the symptoms or trouble encountered with each piece of equipment, part and service required. Contact us at 1-800-843-1320 or at oldphoneguy@oldphoneworks.com to obtain a return authorization number. Package your repair carefully as we are not responsible for any any damages that may occur during shipping. Be sure to put the return authorization number on the outside of your package. Please insure your package for its value and use the carrier you trust the most. Oldphoneworks are not responsible for any items mishandles or mishipped to us. A 30 day return limited warranty is provided on replacement parts and labor performed. This warranty covers defects resulting from normal use, excluding damage from shipment, handling, improper installation, or electrical fluctuations. 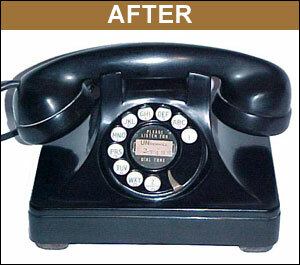 Oldphoneworks shall not be liable for any special or consequential damages, or for loss, or expense directly arising from the use of or inability to use the repaired equipment. We will not be responsible for tampered with or misuse of phones. Equipment will be returned by our standard courier at the customers expense.